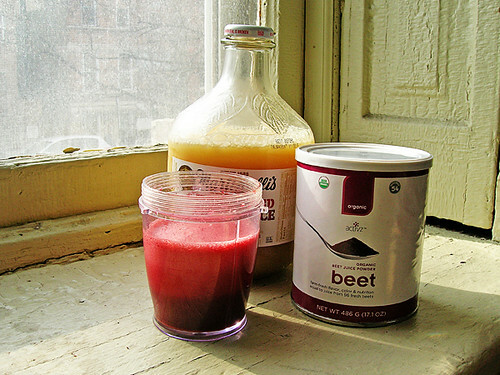 Not gonna lie, I settled on mixing my beet juice powder with apple juice just so I could call it beetlejuice. And well, I already had apple juice in the fridge for buttered rum and mulled wine. Now I can use my apple juice for good. I also settled on Activz Organic Whole Food Beet Powder for my beet juice powder, I first tried Eclectic Institute Beet Juice POW-der and that was fine too, but you can see it comes in a like a vitamin jar and I used that up in a second. I'm drinking this before every workout, I need more like a pound of powder that I can keep in the fridge and the Activz fits that bill. I'm giving creatine a try again and have been throwing that in, too. Creatine doesn't dissolve all that well in anything, this has been a good place to hide it. You don't actually have to blend these in a blender, you can also just put them in a jar with a lid and shake the hell out of them. Or I suppose in a glass and stir them with a spoon.